Get Your Factory Building Up . . . And Fast! We are a prefab factory construction company based in Lagos Nigeria. 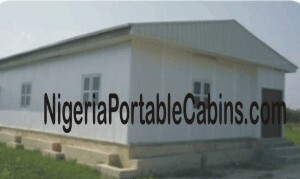 Our head office is in Lagos Nigeria but we offer prefab building construction services to customers all over Nigeria. If you're looking for a reliable prefab factory construction company to build you (or your company) a steel factory building fast, just contact us right away by filling the simple form at the bottom of this page. And your dreams will come true pretty fast. The good news is . . . we build custom factory buildings. This means you can provide your own factory design and we will build to the specifications in your prefab factory building plan. Alternatively, you can order any of our prefab building plans and your steel factory could be ready in a matter of days (or a couple of weeks) depending on the size of the factory you want to build. Factory construction requirements differ from industry to industry. And the specific requirements of the industry your factory belongs must be taken into consideration at the factory design stage. When the entrepreneur (or potential factory owner) thinks through the requirements for his particular industry type and obtains information about regulation requirements from the appropriate regulatory authorities, he saves himself the hassles (and expense) of costly modifications after the building construction is completed. Let's take an example to drive the point home. Suppose you wish to setup a food factory in Nigeria and one of the requirements by the regulatory authorities is to avoid the use of glass within a food factory because of the potential for the glass to shatter and cause contaminate. If you know this in advance and you want us to build you a food processing factory, simply specify that you want windows with plastic glass instead of regular breakable glass. And windows with plastic glass will be installed in your factory during the factory construction stage. Suppose you fail to include this in your specification? You may end up spending money to replace the glass with non-shatter plastic glass when the regulatory authorities visit and demand that this should be changed. The above is just an example of how planning in advance and knowing your industry's factory building requirements can save you money. Remember . . . we build prefab factory buildings to customer specifications. Simply tell us what you want included in your factory and we will build to your requirements. Fill the simple form below to order a quick built prefab factory building or steel building.